Thursday Night at 6:30pm we had the first of this year's fun runs on the bridle and bike trails of Umstead State Park. No one knows for sure how many years ago the club started doing these social weeknight runs but it's been a long time now and they continue to grow in popularity. Not really sure who thought it was a good idea to run here in the heat, hills and humidity either, but what better way to get together with a bunch of other runners on a summer evening? I'm also not sure how I ended up in charge of the series last year but I enjoyed doing it and this year I'm back again. The format really hasn't changed to my knowledge over the years although there have been some course variations. We are using the same course from last year for the 2007 runs. The runs are held for four Thursday evenings in August with distances in descending order each week of 12K, 10K, 8K, and 5K with a 5K option each week. The runs are non-competitive although some runners choose to run all out to test themselves. We do have some giveaways from the club and our series sponsor, which is Inside Out Sports of Cary again this year. Since I'm in charge I decided this year to add a special prize, the Ultraman Joey Award. I run the course before everyone arrives and the runner closest to my time is the winner. The time is held secret until the run is over so no one can try to aim for a particular time. And each week I will run a different type workout so the pace will vary from a run/walk ultra style one week or maybe a tempo run the next. The first run was almost cool compared to last year with it only reaching about 90F and of course the typical humidity. I expected a good turnout but with 10 minutes to go we only had about 30. But then cars kept coming and by the time I sent them on their way, we had 62 signed in, which I believe is the 2nd highest total in the years in have been coming out. Several other stragglers showed up a little late. I gave my usual welcome speech and trail briefing and sent them on their way. Even with the heat, most chose to go for the full 12K. A few others made a wise choice not to push too hard and turned around early. Then there were several others that wanted a hard workout and really pushed the pace posting some impressive times on the tough course. As the clocked ticked up toward my time it was looking like Nathan Ward would be the Ultraman Joey winner with no one else in sight, but then Jenn Ennis came into view and amazingly only missed my time of 1:11:40 by 1 second! I doubt anyone else will come that close over the next 3 weeks. I had just run an easy, normal pace run this time. What will my workout be next week? Come out next Thursday and find out. Maybe you can be the winner. Angela Candies was the lucky winner of the $75 gift certificate from Inside Out Sports. Showing a total lack of good judgement and common sense, 45 runners showed up to run 10K on the 2nd hottest day ever recorded in the Triangle area. At 4 o'clock the temperature reached 104F just missing the record of 105 set in 1986. ( I ran 10K in Garner that day in the middle of the afternoon ) By the time 6:30 Pm rolled around I'm sure it had cooled off to no more than 100F. It actually didn't feel that bad to me as I sat in my chair in the shade waiting for the runners to complete the course. A handful opted for the shorter 5K but once again the majority were brave enough to face the heat. Jarett Prady was the first finisher in 38:56, an amazing time on such a tough course in these brutal conditions. He was followed a couple of minutes later by John Royal, who was also 2nd last week. The Trail Angel, Laura MacLean was the first woman. Frank Werner, making a rare appearance to Umstead was the winner of this weeks Ultraman Joey award. I had done an ultra style run/walk pace to set the target time. This was Frank's first time on the steep hills of North Turkey Creek and he says it will also be his last. As we awaited the last runner, a thunderstorm was fast approaching so we scrambled to prepare for the prize giveaway and pack everything away. A couple of very close lightning strikes convinced us to just give away the Inside Out Sports $75 certificate and make a bee line to our cars. Laura was a double winner tonight and took home the award. I'm sure this will always be remembered as the hottest August Series ever. Temperatures had dropped over the weekend but as Thursday neared, the mercury began to climb again. A new record for August 16th was set at RDU of 101F but by 6:30 it had dropped to "only" the low 90's. This did not deter 47 determined runners to come test themselves once again on the hills of North Turkey Creek. Jarett Prady returned and was the fastest man in an amazing sub-30 performance. On the ladies side, young Katie Markley finished way ahead of all the other women with a big smile in about 37 minutes I think. John Richardson was the lucky Ultraman Joey winner just missing my 45:11 time by about 15 seconds. I had gone out fast but like most everyone else, wilted in the heat and hills coming back. Charles Scharlay was the winner of this weeks Inside Out Sports gift certificate. The final run, a 5k will be this Thursday. Afterwards we will have a brief club meeting at Fat Daddy's on Glenwood Ave. The prize drawing will be held at the meeting so everyone needs to come. The final week of the series brought some cooler temperatures, only in the upper 80's but it was probably the muggiest night so far. We had 43 runners show up for the 5K finale. I was surprised that none of the top 3 men's finishers from previous weeks showed up, but that left it open for someone else to take top honors. Unfortunately I didn't get the name of the young man in first or the fastest lady. If anyone can help identify them I will be glad to acknowledge their efforts. Lena Hollman was our most enthusiastic winner of the Ultraman Joey Award. 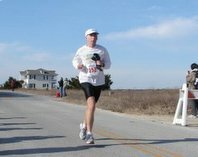 I had run pretty hard again but once again wilted on the return trip, finishing in 26:45. Lena was only about 5 seconds off that time. After allowing everyone a little time to cool down, we headed over to Fat Daddy's for some wings and a brief NCRC meeting. The meeting was brief and after a short history of the roots of ultrarunning by the guest speaker, yours truly, the prize drawing was held. Our lucky winner of the Inside Out Sports gift certificate was Jennifer Fratello. It was a real pleasure to host these runs again this year and I look forward to next year. Joey- Thanks for MC'ing the event! This straggler had a great time! Look forward to seeing everyone next week!